Bobby Jo Valentine had the longest flight of his life, between Kansas and Oakland, last October. The North Bay native and musician was in the heartland playing shows with his partner at the time when they got word of a fire on Atlas Ridge near their home in the Napa hills. "We got an early flight back as soon as we heard, so we didn't know if the fire had actually hit our home the whole ride back," Valentine says. "When we landed, one of our friends had texted us pictures of the house just completely gone. All you saw was an apocalypse." As a professional traveler, Valentine says he's not much of a materialist, but the loss was still a gut-punch. Yet almost immediately, the musical community came together to offer them support in the form of donated goods and funds. "I really feel for the people who don't have a safety net of support to help them after the fires," Valentine says. This month, Valentine and other North Bay and Bay Area songwriters release After the Fire: Vol. 1, a benefit compilation album spearheaded by Mill Valley musician and producer Scott Mickelson. Mickelson wanted to help so he called up Valentine, Sam Chase, Travis Hayes, David Luning, Josh Windmiller and other musicians to contribute to the album. Valentine's track is "There Is a Shore," an optimistic song about finding inner peace when the world around you is in chaos. Valentine also paid for manufacturing the CDs. "I really want people to hear the music," he says. —C.S. There are several different comic book stores in the North Bay, but none of them has quite the atmosphere and lineup of events as Comics FTW. I go out of my way to visit, not because of its selection of comics, but because of the people and its monthly trivia night. My first trivia night was a complete accident. I came in to pick up a comic I ordered, and then decided to stay when I noticed like-minded people were staying too—and they had karaoke and drinks. I signed up, enjoyed the company of people I rarely see outside of an internet screen, and then it was time for the main event. Our team fiercely competed with several others to claim $25 in store credit. No TV show was too obscure, no comic book too unknown to qualify. From Doctor Who to Doctor Fate, our nerd knowledge was pushed to the very limit. And when the night was over, I went home victorious, with a 150-page Elfquest comic that didn't cost me a dime. Those who want to get their geek on with good friends can't go wrong here. Trivia Night happens one Sunday a month. Sign-ups start at 7pm, and the nerd-dom begins at 8pm. 1435 Santa Rosa Ave., Santa Rosa. 707.284.2272. comicsftw.com.—A.R. Come for the fringed sleeves, stay for the fun. Most metalheads in the North Bay know vocalist Lance Ozanix as the face of veteran Sonoma County thrash band Skitzo, in which he has notoriously regurgitated green slime onstage since 1981. Fewer metal fans may know that Ozanix has been doing a drop-dead impression of heavy metal's original frontman, Ozzy Osbourne, for over a decade in the awesomely old-school Black Sabbath cover band Electric Funeral. As if Ozanix's long hair and perfectly screeched vocals wasn't enough to conjure up Ozzy's "Prince of Darkness" aesthetic, his outfits make Electric Funeral a must-see show, if only for the fringed-sleeves. Yes, I'm talking about those stringy, wavy, essential shirt sleeve accessories that all the cool kids would have craved back in the days of beaded curtains and shag carpets. Draped from Ozanix's armpits, extending all the way down to his wrists, these majestic tassels move like the hypnotic wings of some dark angel when the band powers through a set featuring 1970s-era Sabbath hits like "War Pigs" and "Iron Man." The tassels really tie the band together when Ozanix wails about "generals gathered in their masses" or when he's urging his band mates, guitarist Tim G Sabbath, bassist Dave Delico and drummer Liz Daniels, to rock like they've never rocked before.—C.S. Sebastopol artists Patrick Amiot and Brigitte Laurent didn't let the North Bay fires of 2017 deter them for long from doing what they're best known for doing around Sonoma County: turning junk into smiles. Amiot's work first attracted the attention of neighbors on Florence Avenue in Sebastopol, which is now a sort of junk-art lover's destination in itself: the tin dogs, jaunty little cable cars and towering chickens are guaranteed to elicit a grin. Well, the North Bay fires of 2017 saw heroism from some, inspired volunteerism from others and a whole lot of thankfulness to first responders in word, deed and many handwritten signs. But smiles, fun, whimsy? For many more residents, the fires were a dispiriting sit-out, confined to quarters under dirty nacho-orange skies. 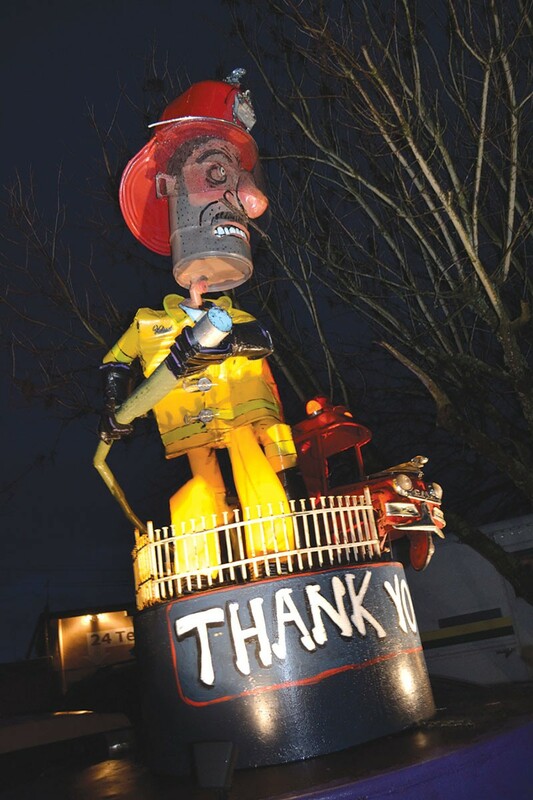 To express gratitude, Amiot set to work, creating a towering sculpture of a yellow-clad fireman (Laurent paints the sculptures), teeth gritted in determination, stubble-faced from overtime hours on the line. It was installed on the corner of his art-studio property (which is located just two miles due south of the Tubbs fire, and, trivia for longtime Bohemian readers, is the former location of Black Sparrow Press), facing the SMART train tracks. Of course, there's a merry little vehicle in the scene, a red Santa Rosa fire engine numbered "707." The action happens most nights, when the siren lights up and a wind machine in the base of the sculpture causes windsock "flames" to lick at the fireman's feet. The caption says it all: "Thank you." And thanks for the smiles, folks. Cleveland Avenue at 10th Street, Santa Rosa.—J.K. About 70 percent of theatergoers are women over 40. However, most plays are written with either younger women or men in mind, leaving very little for its biggest audience. In 2016, June Alane Reif, president of the Valley Players board of directors, got together with some of her friends to do something about that gender imbalance. Napa's Valley Players, which became incorporated just last year, operate with the goal of empowering women over 40 on stage and behind the scenes as stagehands. While still a new group with only a handful of members, the Players have produced such plays as Harold Pinter's The Lover and Christopher Durang's Vanya and Sonia and Masha and Spike, which feature older players or have non–age specific roles. They have also collaborated with local playwrights, such as Sonoma County resident Lorraine Midanik, who wrote a screenplay the troupe will perform soon. According to Reif, women who have retired from theater as they got older have been coming out of the woodwork to help out. The theater company is always looking for more volunteers, and will gladly take anyone of any age and gender. valley-players.com.—A.R. Rebecca Rosenberg lost everything in the fires, including her diamonds and gold. But the real treasure that burned was her archive on Jack and Charmian London that she had gathered over the years and then used to write her novel, 'The Secret Life of Mrs. London,' which has roiled the Jack London faithful. 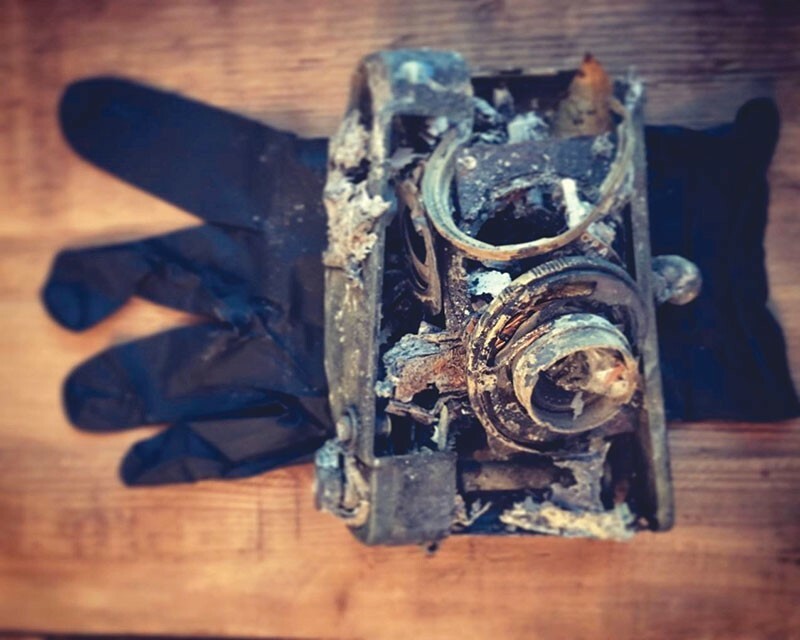 Fortunately, the novel was already finished and in the hands of her editor at Lake Union publishing when the fire incinerated her Kenwood home and everything in it. The Secret Life of Mrs. London suggests that Jack London really died of a morphine overdose, and that Charmian persuaded Jack's doctors to say that the cause of death was uremic poisoning. Some London fans wish the book had gone up in smoke. Even with her archive intact, Rosenberg would be unable to prove her hypothesis beyond a shadow of doubt, though London's doctors did prescribe morphine to mask his pain. In The Secret Life, Rosenberg has imagined a Jack London who is unable to satisfy his wife. In these pages, Charmian enjoys a fiery affair with the magician and escape artist Harry Houdini. It's a fact that Harry and Charmian carried on outrageously. But the dialogue between Rosenberg's lovers is pure fiction. It might make prudish readers blush. Read it at your pleasure or your peril.—J.R. 'Empire on Main Street' could have been a tuchus-kisser, and to its great credit, it's not. Jessica Congdon wrote, co-produced and photographed this candid short documentary about the successful but controversial Guerneville businesswoman Crista Luedtke. This second-generation restaurateur, a freckled Wisconsinite with a rockabilly haircut, made ambitious renovations of several Russian River restaurants and entrepots—including Big Bottom Market, Revival at Applewood and the Boon Hotel. Her work brought in money and out-of-towners as renowned as Oprah herself, who declared Luedtke's biscuits the best she'd ever had. Yet Luedtke sometimes angered the locals who liked the funk and decay of Guerneville just as it was. Congdon had top-notch access to her subject, enough to hear the story of how Luetdke's marriage eroded under the strain of work. In a broader sense, this could be the story of the sacrifices and gambles of any kind of entrepreneur. Empire on Main Street screens at the Sonoma International Film Festival on March 23–24. sonomafilmfest.org.—R.V.B. I realized I love Santa Rosa's Toy and Comic Con after meeting the Pink Power Ranger, Ash Ketchum and Samurai Jack (well, the actors who lend their voices) in quick succession. The annual event is the brainchild of toy shop owner Mike Holbrook, who was tired of traveling to other towns and cities to sell his wares. While it is not the only convention in Sonoma County, it is by far the largest, with stalls and special guests for comic book fans, and fans of geek culture in general. Previous events have also included live-action Dungeons & Dragons games, disc golf, fencing and even amateur wrestling. The biggest draw, however, is the cosplay contest. Taking place in the last hour of the convention, people from ages 6 to 60 get together to show off their costumes and see who has the best one. At the next Toy Con, in September, Lou Diamond Phillips and Firefly's Adam Baldwin are slated to appear! santarosatoycon.com.—A.R. Mosaic artist and longtime Napa resident Kristina Young was already three years into her massive art project memorializing items lost in Napa's 2014 earthquake when disaster struck again in the form of the Atlas Peak and Tubbs wildfires. The Quake Mosaic began as a planned community art piece made up of objects damaged and destroyed in the 2014 quake. "Each person had a story about the object they would bring in," Young says. "They all had nostalgic, sentimental meanings to the people." Currently being developed on a site within the developing Rail Arts District in downtown Napa, the mosaic's design uses these objects, applied to the outside of a rail car donated by the Napa Valley Wine Train, to represent layers of sediment disrupted by outwardly radiating seismic waves. In October, Young broadened the scope of the mosaic to add objects found in the wildfires' aftermath. "This is very in line with what the original concept of the project was," Young says. "It's documenting the process of healing after a trauma." Young has already received objects from several artists and community members, and is currently teaming up with St. Helena–based Nimbus Arts to hold mosaic workshops where the public can contribute to the project with hands-on activities, all tools and instruction provided. For more info, visit nimbusarts.org/calendar.—C.S.